Travel to a new place, a new understanding, and a new way of being. and a new way of being. This is the first card in the element Earth. If you drew this card, your journey of transformation begins now! 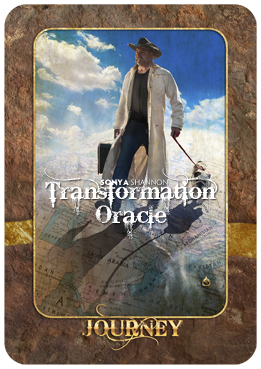 The card is the Transformation Oracle’s “hero’s call” to begin a quest. It’s time to take a risk and move outside your comfort zone. Go abroad and explore. Take the long, circuitous or scenic route. Or at least order an dish you’ve never tried! This is the time to jump-start your growth by venturing to new realms. Be adventurous and broaden your scope. But bring some comfort and protection on your journey, as you may need it. If this card appears upside-down, you may be stuck in an old, comfortable rut—or the timing may be off for travel. If you do travel, listen to your body and make sure you take extra steps to stay healthy, as adventure can stress sleep patterns and digestion. For more advice, draw another card or study the other cards in your spread, particularly those in the Earth element.